Subsequent vein surgery and UGS failed to provide lasting benefit. 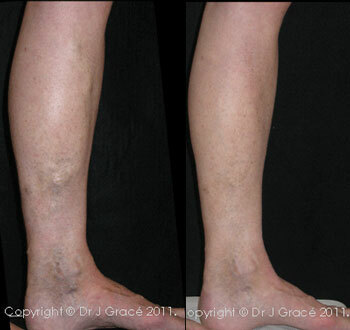 There was progressive deterioration in the condition of the skin in the lower leg. There have been stories of patients who have bled to death overnight as a result of a ruptured varicose vein. This patient also suffered ongoing leg pain and heaviness which was worse at night. A single treatment session of endovenous laser ablation greatly improved the underlying circulation and relieved the patient of the gnawing leg pain. There is a 1 in 5 chance that this patient will require some form of additional treatment over the next 6 years.